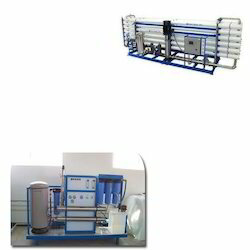 We offer Reverse Osmosis Equipment for Water Purifiers to our valuable clients. Ideally used for the reduction of dissolved solids from feed waters that bear high salinity, the range is also put into use as an equipment for the transformation of drinking water to highly purified water. Our products are tested under the vigilance of our experts on various parameters to render maximum client satisfaction. Looking for Reverse Osmosis Equipment for Water Purifiers ?